We’ve all heard the speeches from our forebears about how their struggle to get going in life was far more difficult way back when. They earned the right to brag. Beginning a career and carving a path for yourself has always been a battle. None of us walked debt-free into an immediate executive position without the aid of inherited wealth or favor. We’ve all fought our tails off to get where we are, and are still fighting to get to where we want to be. Except the younger generations below us. Those kids have it easy! Right? That generational bias is currently geared toward Millennial employees. Many assume that their iPhone and video game-filled lives are free of responsibility and pressure thanks to years of coddling and parents who can’t say no. While there is some truth to those stereotypes, don’t fall into the trap of assuming that Millennials don’t have unique circumstances and challenges to overcome. The circumstances surrounding the Millennial professional are different from anything we’ve seen before. The economic risks and pressures they face are higher than those endured by previous generations, yet opportunities are often slim and fleeting in a corporate culture built on high expectations and frequent layoffs. We highlighted a few of the most drastic differences in the above infographic, featuring data compiled by our friends at Alumni Access. 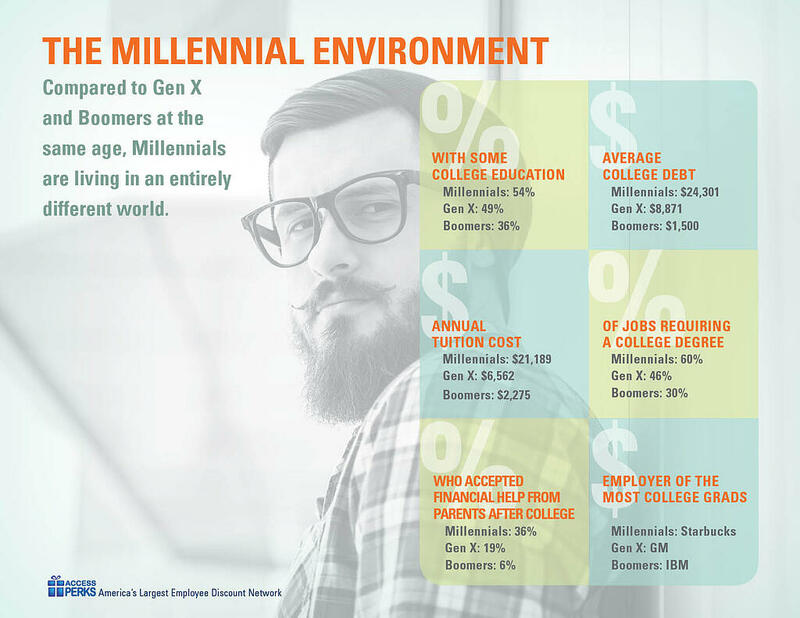 We dig deep into these circumstances and how they’ve shaped Millennial employees in our newest eBook, which you can download by clicking the banner below. To understand how Millennials became what they are (and are still becoming), it’s important to look at the circumstances they’re emerging from. For example, IBM was the biggest employer of Boomers as they exited college (circa 1976), and GM employed the most Gen Xers in 1990. Millennials? They’re slinging coffee at Starbucks, a very good employer but not exactly the ideal place for someone with a Bachelor's degree. This is despite (or, perhaps partly due to) the fact that more Millennials (54%) have at least some college education compared to Boomers (36%) and Gen X (49%). Meanwhile, college tuition has increased by nearly 900% since 1970. The typical Millennial carries over $24k in student debt, compared to the $8800 Gen X had at the same stage. It’s isn’t as if Millennials have a choice - 60% of jobs now require a degree, compared to just 30% in 1970 and 46% in 1990. As a result of this financial pressure, 36% of Millennials have had to resort to asking mom and dad for some dough. Just 6% of Boomers had to receive financial support from their parents. Similarly, they have a reputation for job hopping. Just 1% of HR professionals consider their Millennial employees to be loyal, yet a new job typically comes with a 10%-20% raise (compared to an average of 4% from current employers). Why wouldn’t they hop around? As it is, 82% of Millennials consider themselves loyal to their employer, but their definition of “loyal” is much different than what you’re used to. The typical Millennial thinks a seven month stay at a job indicates loyalty; Boomers see that number as five years. The bottom line is the stakes are higher and the pressure is more intense for Millennials to get an education at any cost, get a decent job, and start clawing their way up the corporate ladder. They’ve got debt to overcome, and are increasingly aware that they’re navigating a layoff-happy culture that emphasizes profits over people. As a result, they’re working longer hours and putting off the American dream of house/spouse/kids until later than the norm. Millennials aren’t walking barefoot and uphill both ways to their jobs, but that doesn’t mean their circumstances are any less challenging. Their challenges are simply different, and perhaps, even more difficult to overcome than the physical toiling of generations past. This isn’t a call for pity. It’s just the world they’ve been given, and it’s up to you to help them make the most of it. It’s a great opportunity for every employer to cement long, productive relationships with their Millennial employees from square one. As we point out in our new eBook, every trait that’s different or unique about Millennials can be geared toward the greater good for the business. From their longing to work offsite to their desire for cool corporate perks, they’re simply evolving with the times - and that’s a good thing, because the end result has shown to be more profitability. Engaging Millennial employees isn’t simply a “nice to” any longer. It’s a “need to,” as revenue and profitability are on the line. 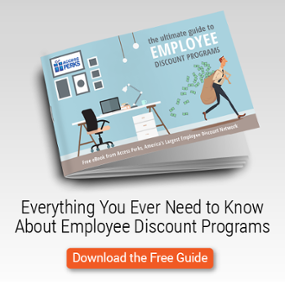 Employee engagement is critical to both workplace productivity as well as customer engagement. Having a clear understanding of what makes them tick, and understanding that they are fighting battles to succeed, will give you a leg up in getting the most out of your Millennial employees. Access Perks is a division of Access Development | ©2011-2019 | All rights reserved.